Unfurnished mid terrace house in a very conveniently location within easy walking distance of the shopping centre, leisure centre cinema and town centre. Ideally situated for travel to Belfast. Accommodation comprises: entrance porch, open plan lounge with fireplace, kitchen with fitted units, two good bedrooms and excellent bathroom. Rear yard and garden. Gas fired central heating. Double glazed windows in pvc frames. 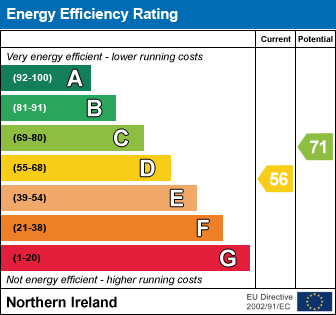 I am interested in 61 Church Street, Newtownards. Please contact me about this property.